Not tinting,not Permanent Makeup.Tools are NON-INVASIVE unlike needles. Reinforced natural lip color.It will fade over time. Machine use for Lip Coloring and cartridges developed by French dermatologist so less damage on your skin. 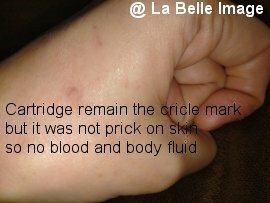 The cartridge is NOT NEEDLES and surfs on the skin and NON-INVASIVE. 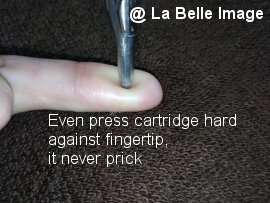 ✽The tip of the cartridge is a thick metal and it hard.In the treatment,the cartridge surf repeatedly on the lip skin.So it's not completely painless and not feeling anything. 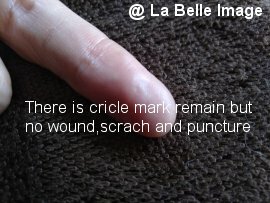 Pingments are organic developed by French dermatologist. Fill in the medical record to confirm your physical condition.Please do not hesitate to ask me anything you do not understand. Wipe off dirt and bacteria from lips and surrounding. Apply an organic moisturizer developed by a dermatologist on lips. 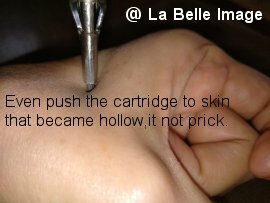 Slide the pigmented cartridge over the skin of the lips and put the color. 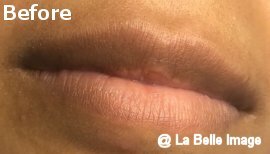 Wipe off the pigment around lips and moisturize them.I will give you after care cream. ✽If you are worried about allergy, you can receive a patch test of pigment beforehand separately from the treatment day. The patch test fee is ¥3,500. ✽At least 3 times of successions continuously needed to remain pigment. ✽Result of Lip Coloring is NOT like Permanent Make Up. It finish slight coloring just like additional of blood color and adjustment color irregularity. ✽Place colors on the customer's natural outline.It is not sharp and clear outline. ✽Please keep about 1 month between session and session. ✽Immediately after,color look strong and it takes 3 to 4 days to be natural. Please use a mask if you want to cover. ✽The cartridge is not a needle, but hard metal stick.The lip skin is very thin and soft so in case it may be swollen.There are individual differences in the degree of swelling.On the day, it is possible to minimize swelling as much as possible by chilling well after coming home. If swelling occurs, it may last for 2 or 3 days.